From now until Small Business Saturday on Nov. 24, I’m going to feature a local business with great gift ideas for everyone on your “nice list.” Today, I’m featuring the Miller Gallery. They’re located in Hyde Park Square (which will have free valet parking Saturdays Thanksgiving-Christmas 10a-6p by the way!). And, yes, I realize this is my third blog in a month about Miller Gallery and, yes, that means I’ve become slightly obsessed with them (especially after they gave me the opportunity to meet Tyler Shields, one of the amazing artists they’re currently featuring)… but I’m ok with that because I could be obsessed with worse things than cool art galleries. I digress. So, with this series of Small Business Saturday posts I’ve been doing, I’ve mainly been giving gift ideas you can find at local businesses. But I understand if you aren’t able to shell out several grand for a Tyler Shields original to give grandma this Christmas. But there is something to be said about giving the gift of an experience. So, if you have an art lover on your list, make a date to take them to brunch (Teller’s has a KILLER bloody mary bar on the weekends!) and then over to check out the Tyler Shields pieces or Altered States exhibit featuring Rob Jefferson and Jonathan Queen. Then, after, maybe pop around to some of the other cool local businesses I’ve been writing about on Hyde Park Square this week! 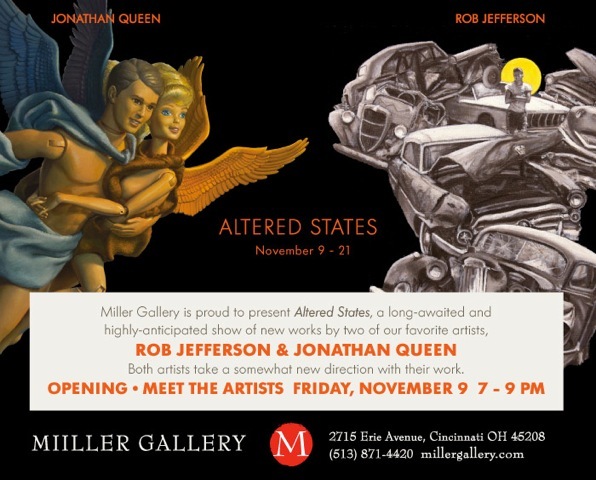 Altered States at Miller Gallery November 9! You’re going to think I’ve been living at the Miller Gallery lately, since I just wrote about Tyler Shields’ exhibit there a couple weeks ago! But on November 9, they’re opening a new exhibition that I’m really excited about with artists Rob Jefferson and Jonathan Queen! The show will be called Altered States and will be featuring the artists newest works, which have taken different directions since their original art. Jefferson’s show will focus on a singular, iconic image: the car. While Queen’s work will focus on altering objects from their original forms. The show will run from November 9-21 and the Opening/Meet the Artists will be from 7-9pm on November 9. For more information call (513) 871-4420 or visit the website here.